Last week I found a sweet deal on White Lily Flour — two 5 lb bags for $7.00. I put in an order and the flour appeared on the doorstep two days later. Since then I’ve been tearing through the White Lily recipe database trying to determine if White Lily really is worth paying a little extra for. For those of you not familiar with it, White Lily is different from all-purpose flour in that it is made with a low protein soft winter wheat, which means less gluten formation and more tenderness in baked goods. According to some people, it is the secret ingredient in Southern cakes, cookies and pies. But why not just use cake flour? Like most brands of cake flour, White Lily Flour weighs 4 ounces/114 grams per cup and is bleached. However, it is not quite as bleached as cake flour and supposedly less acidic. Meh, I guess so. I can’t really tell, quite frankly. However, it sure did make my pound cakes, chocolate cake and red velvet cakes softer. I wasn’t crazy about how it worked in brownies and sugar cookies, as it gave them kind of a chalky feel. 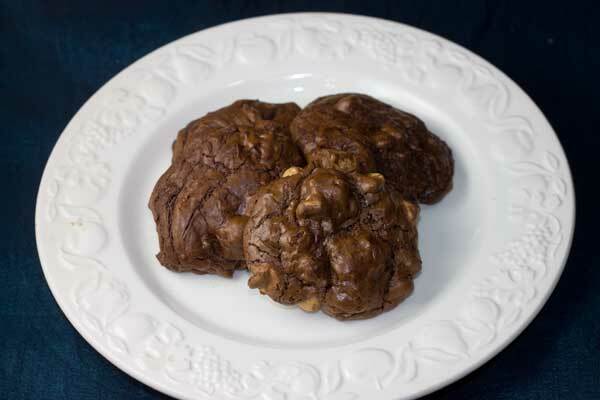 But I did love it in these double chocolate cookies, which are ethereally light and rich at the same time. But who’s to say they wouldn’t be as good with cake flour? So my question is, do you use White Lily? If so, do you have a favorite way to use it? Over the next few weeks I’ll be telling you how it works in certain recipes, but if you have a recommendation or a recipe you think I should try, let me know! The protein content of White Lily AP Flour is the same as most cake flours. ( a lot cheaper than cake flour). So the answer is yes. I would not use it to make breads that call for AP Flour. Have not tried it with cookies, but I am today. Hi Alex, in my experimenting it has worked just fine in place of cake flour. It weighs the same cup per cup (4 oz) and yields a soft, tender, crumb. I live in Tennessee and did not realize White Lily was any different from any other brands of flour. I have always used White Lily. and it is a lot cheaper here than 2 5-pound bags for 7 bucks!!!!! It’s like 2 dollars something here for a 5 pound bag. Anyway, I love it and use it for all baking. and always have great results. Anna, I use White Lily for the best cupcakes, cakes, pie crusts and biscuits. But when I make muffins I make them with as much whole wheat flour as the recipe can take and still taste good along with unbleached all-purpose flour where called for. I even like the name White Lily. Yes, the cookies shiny and chocolatey! White Lily flour is not something I see here so I’ve never used it. Your cookies look awesome though. I seriously don’t think I’ve ever seen White Lily flour here. Reading all this does make me wonder if cake flour was used for a pie crust how it would be? And now I’m curious to check out Sharpei cookies. Okay, I’m going to put the Sharpei cookies on the list. Claire, you might want to check out Soap.com. I found it while searching for shaving supplies and got sidetracked by the grocery section. The price for White Lily was pretty good. I love using White Lily in my baking! Mississippi girl here! My sharpei cookies need it and REAL butter or they don’t work. 🙂 I’ve made pie crusts with it as well and they are delicious. The closest Kroger (love the South, huh?) has recently stopped carrying regular AP White Lily and it drives me bonkers. Why do they have self rising but not regular? Gotta get it from another store! I will be very curious to see how the flour does in your other experiments this week. These cookies look fantastic, though! I have won many ribbons for my pies at the Indiana state fair using White Lily. Bunny, so far I’ve had the best results with biscuits. Have you ever used it in pie crust? White Lily is the only flour I use. I was born and raised in Georgia and can tell you that if you’re a true Southerner you have White Lily in your pantry. Best use? Buttermilk biscuits made the traditionally Southern way with flour, Crisco, and buttermilk (no sugar). On decadent days you add chunks of cheddar cheese to the flour/Crisco mixture before adding the buttermilk…oh my! THAT is heaven!